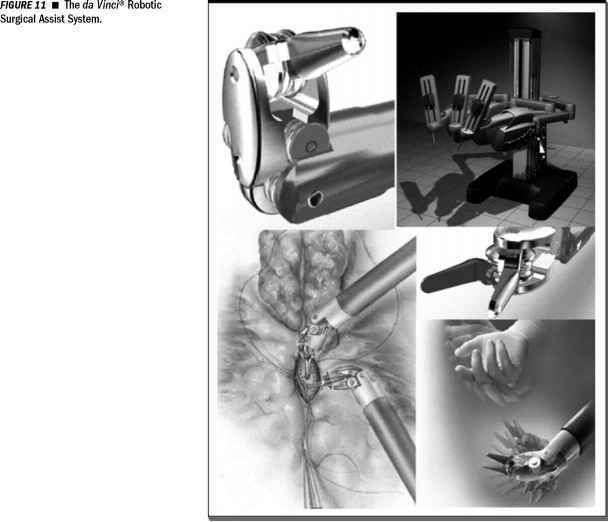 The next generation of surgical robotics required the downsizing of mechanized instruments to reproduce the complex ability of the surgeon's arms and hands (116). Next, the surgical tools themselves needed to be added or subtracted from the devices so that surgical multitasking was possible. To control and coordinate the functions of the robot requires a computer. The computer is responsible for interpreting the surgeon's actions and transforming them into the movements of the robotic arms and hands. This requires incredible fidelity and incorporates a wide range of motion. The computer is translating the surgeon's movements into precise codes to smoothly and rapidly manipulate the robot (Fig. 11). Here the robot is in direct contact with the patient and the surgeon is removed to the controlling station. As with the laparoscopic surgery removing the surgeon from actually seeing the surgical field, the robotic hands are removing the laparo-scopic instruments from actually touching and performing the surgery. The actual robotic tools, or end-effectors are located at the distal end of long instruments which are inserted into the patient through laparoscopic trocars. The movement of the instruments is controlled manually at the work station. To allow the end effector to be maximally effective at least six degrees of freedom are necessary. A great deal of research effort has been applied to solve the problem of the actual surgical interface (117-119). That is what type of device is best for the surgeon to manipulate that will provide the computer with the information necessary to perform the surgery. Possibilities include scissor-like hand pieces that provide the computer with the data necessary to manipulate the end effector. Glove-like input devices have been proposed and view-directed controls utilizing the endoscopic image itself to be the frame of reference are being investigated. Some input devices are position controlled and others are direction controlled. In the former, the movement of the end-effector is coupled to the movement of the input device by the surgeon. A continuous movement of the input device is needed to achieve continuous movement of the end-effector. In the direction-controlled interface, the input device controls the velocity of the end-effector. Therefore, no continuous movement is necessary to achieve continuous movement of the end-effector. One study evaluating various input devices included a spacemouse, free-flying joystick, immersion probe, and head-tracking systems. Wapler suggested that for guiding the endoscope a head-tracking system would allow a more intuitive method of control (120). For manipulating the end-effector, the following requirement should be met: the manipulator must be compact enough to allow at least three systems to work independently without danger of collision, the patient should be manually accessible at all times, the insertion point must be kept invariant when moving the end-effector, allowance must be made for patient movements, all endoscopes and instruments must be manually controllable in case of manipulator failure, and the movement of the end-effector must not be self-locking. In addition, there are three options for supporting such a robotic system in the operating room, these include namely, a stand-alone system, a ceiling-mounted system, or a system that attaches to the operating room table. Both the stand-alone and ceiling mounted systems would require more room and have special precautions to ensure that no relative movement occur between the operating room table and the manipulator's base. At the beginning of surgery, the abdomen is prepped and draped in the same fashion for laparoscopic surgery. When the trocars have been positioned, the manipulators are attached to the operating room table. Each manipulator is manually brought into position such that the invariant point is exactly at the trocar. When all of the manipulators are in place, the actual surgical procedure is begun. Currently the surgeon has only visual feedback from the video-monitor. There are ongoing efforts to include force-feedback (i.e., haptic input) into the robotic manipulators so the surgeon can perceive subtle nuances of the laparoscopic environment (121). There are two currently available laparoscopic robotic units in use, the Zeus® system and the da Vinci ® c system, however others are in the works. The Zeus system has recently been acquired by Intuitive Surgical and the systems may possibly merge, but the daVinci system was approved in July, 2000 in the United States. The Zeus™ Robotic Surgical System has an ergonomic workstation with rather conventional appearing handles. 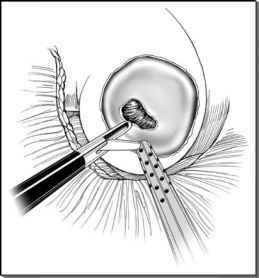 The surgeon's movements are scalable to the surgeon's specifications. A ratio of 5:1 means that for every inch the surgeon moves the handles on the console, the robotic surgical instruments would move one-fifth of an inch. Tremors can be filtered out as well. The Zeus computer translates the surgeon's movements to the end effectors placed via trocars inside of the patient. The instruments themselves act similarly to conventional laparoscopic devices except that the surgeon does not actually touch them. The monitor on the Zeus system is a standard video image, the surgeon does have the option of wearing specialized binoculars to view the image in three-dimensional (3-D). The da Vinci company has the capability to add three-dimensional imaging full time without the need for the special glasses, but current research has not demonstrated a significant advantage for these image systems. The other robotic system is da Vinci. This robotic surgical system has an articulated wrist that allows six degrees of freedom during the performance of laparoscopic surgery (Fig. 11). This wrist addition allows for the two additional degrees of freedom and there is some basic evidence that that additional motion translates into more adaptive ability by skilled and nonskilled surgeons. The downside to the daVinci instrument tips would be that they are more complex, necessitating the 8 mm trocar portals. The da Vinci surgeon console does not approximate anything like standard laparoscopic instruments. The surgeon's hands, wrists, and fingers manipulate a patented articulated Endowrist™. This type of system is necessary to take advantage of the laparoscopic instruments' dexterity. The other major difference of the two surgical robotic systems lies in the da Vinci™ ergonomic viewing console (Fig. 11). The surgeon sits at the console which is designed to support the surgeon's head while viewing the three dimensional image and has a separate adjustable surface on which the surgeon can rest his/her arms. The vision system is fully three-dimensional and integrated in the performance of the two robotic arms. The da Vinci system is a stand-alone device that moves in toward and over the patient whereas the Zeus system is component and attaches to the sides of the operating room table as does the separate and independent AESOP™ arm. In both robotic systems, the fidelity of movement is superb and the time delay from surgeon's movement to the robotic instrument movement is imperceptible. The cost of each system is above US$900,000 currently (121).